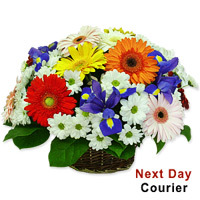 It is a riot of colours with this wholesome arrangement of Daises, Gerberas and Blue Iris complemented with green foliage. This wonderful arrangement comes in a beautiful basket. Note: Due to unavailability of seasonal flowers, some flowers may be substituted keeping the colour theme and the value consistent with the original product.It is a riot of colours with this wholesome arrangement of Daises, Gerberas and Blue Iris complemented with green foliage. This wonderful arrangement comes in a beautiful basket. Note: Due to unavailability of seasonal flowers, some flowers may be substituted keeping the colour theme and the value consistent with the original product.